A federal judge rejected the government's latest approach to Snake and Columbia river salmon recovery Wednesday and suggested it should consider breaching one or more of the Snake River dams as a viable alternative to saving the iconic fish. U.S. District Judge Michael Simon blasted the 2014 biological opinion issued by the National Oceanic and Atmospheric Administration as inadequate, and not only ordered the agency as well as its partners, the U.S. Army Corps of Engineers and the Bureau of Reclamation, to start over, but also said the new effort must follow the National Environmental Policy Act. "The Federal Columbia River Power System remains a system that 'cries out' for a new approach and for new thinking if wild Pacific salmon and steelhead, which have been in these waters since well before the arrival of homo sapiens, are to have any reasonable chance of surviving their encounter with modern man," he wrote. "Perhaps following the processes that Congress has established both in the National Environmental Policy Act and in the Endangered Species Act finally may illuminate a path that will bring these endangered and threatened species out of peril." Simon gave the agencies two years to complete the task. 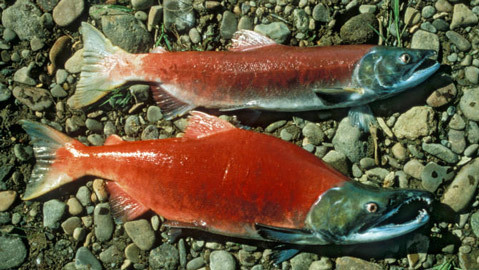 To date, the government's five previous efforts at reconciling operation of the Snake and Columbia River dams with the attempts to save and recover 13 stocks of protected salmon and steelhead have not included the analysis of a wide range of alternatives and the extensive environmental review that is mandated by the National Environmental Policy Act - also known as NEPA. Requiring NEPA review could bring on the sort of cost-benefit analysis salmon advocates argue will show the Snake River dams are far too expensive to maintain for the benefits they provide and that it would be cheaper and more effective to remove them. The corps did a cost-benefit analysis in 2001 that showed breaching the dams would cost hundreds of millions of dollars and keeping them would produce modest economic benefits. Since then, salmon advocates, led by retired corps employee Jim Waddell, have said that analysis was faulty and a sharp decline in barge traffic and the proliferation of wind turbines in the Northwest have changed the economics behind the river system. "I think a thorough job will look at the economics broadly and I think those economics are in favor of restoring the river," said Todd True of Earthjustice and one of the attorneys representing a coalition of fishing and conservation groups that sued the government. The Nez Perce Tribe and the state of Oregon were also plaintiffs in the case that dates back to 2000, when Judge James Redden struck the government's first biological opinion as inadequate. Then, and in subsequent cases in 2004, 2008 and 2010, Redden ruled the habitat improvement projects in salmon spawning areas that were designed to offset fish mortality at the dams were not reasonably certain to occur if they were not guaranteed to be effective. Simon, who took over the case following Redden's retirement, reached the same conclusion. He also echoed Redden's desire that the government at least consider dam breaching as a salmon recovery option. "Although the court is not predetermining any specific aspect of what a compliant NEPA analysis would look like in this case, it may well require consideration of the reasonable alternative of breaching, bypassing, or removing one or more of the four Lower Snake River dams. This is an action that NOAA Fisheries and the action agencies have done their utmost to avoid considering for decades," Simon wrote. Supporters of the dams expressed disappointed at Simon's ruling. Terry Flores with the Northwest River Partners in Portland, Ore., said the ruling is a blow to collaboration between agencies, tribes and river users over the past several years that has been central to much of the habitat improvement work and hatchery programs that were a part of the government's plan. "We are extremely disappointed. We think the ruling fails to recognize this biological opinion is the most comprehensive and science-based biologic opinion really anywhere in the nation. It's been held up as a model nationwide," she said. "Our primary concern is this decision is going to unwind all those years of collaboration that have taken place." NOAA Fisheries, the agency that produced the biological opinion and is charged with overseeing efforts to protect and restore threatened and endangered salmon and steelhead, also expressed disappointment. "The decision will require time and effort to analyze and fully understand. We sincerely appreciate the region's unprecedented collaboration and commitment on behalf of salmon, and the important progress that it has produced. We'll continue our efforts with our partners to protect salmon and steelhead in the basin and work toward their recovery," said Michael Milstein, a spokesman for the agency at Portland.